How to make your hair looks thicker? 1. Shampoo should not be too frequent. Keeping your hair and scalp clean is a must, but washing too often can cause your hair to become sparse. Each time the shampoo washes away the natural nutrients of the scalp, making the hair more fragile and easy to break. Wash your hair 2 or 3 times a week. Use conditioner to nourish your hair every time you wash your hair. Dry clean once a week to keep your hair clean. 2. Use skin care products containing natural ingredients. Most shampoos contain strong detergents that dry and break hair. In addition to reducing the number of shampoos, you should use a shampoo-free shampoo and try to choose a natural or organic shampoo. 3. Avoid excessive use of high-temperature tools. These tools can burn your hair, causing split ends and breaks. Avoid frequent use of hair dryers, straight hair tools and curling tools. Use up to once a week. It is best to let your hair dry naturally. Hairdressing tools can be used in an emergency. If you don’t like how your hair will dry naturally, you can apply some hair styling products to your wet hair to make your hair look. If you have to use hair styling tools frequently, use some heat-resistant products like argan oil on your hair before making shapes. 4. Avoid hair dyeing. Many people like to dye hair, but bleach or other chemical hair dyes can make hair dry and seriously damage the hair. Try to avoid using these hair dyes to dye your hair. You can use a more natural product such as lemon juice to dye hair. 5. learn to comb your hair properly. Regularly combing the hair can evenly apply the oil on the scalp. Too frequent will cause oily hair and hair loss. And using the right comb is also critical. It is best to use a wide-toothed comb. Do not comb your hair when it is wet. At this time, the hair is most easily combed. Comb your head once a day. 1. Make a protein hair mask. 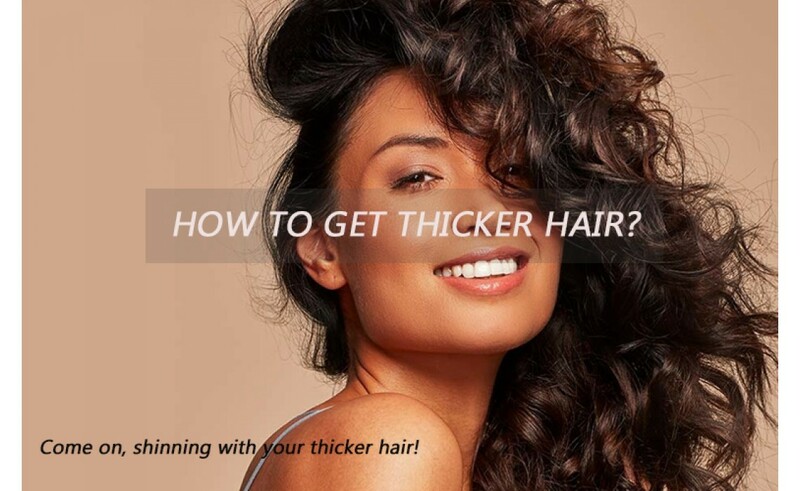 Hair is made up of protein, so you want to make your hair thicker and you have to add it. Mix 1 to 2 eggs (depending on your hair volume and length) with a little fresh aloe vera. Apply the mixture thoroughly and evenly to your hair. After 10 to 15 minutes, rinse off with warm water. 2. Fenugreek hair mask. Fenugreek seeds are not only good for health but also have anti-dandruff and thick hair. Soak the fenugreek seeds in water for 8 to 10 hours. It is then stirred into a batter. It is then applied to the hair and rinsed with water soaked with fenugreek after 30 minutes. 3. Hot oil massage. Natural oils, especially olive oil, cocoa butter, and jojoba oil help to enhance hair flexibility and promote long hair. Massage the scalp with oil to stimulate the hair follicles and promote hair growth. Heat the oil to a comfortable temperature, then massage the scalp with oil and let the oil stay on the scalp for 30 to 60 minutes before washing off. 4. Flaxseed. Flaxseed is rich in fatty acids that help the hair thicken. Soak the flaxseed in the bowl for 5 days. Then spread it on the scalp with flaxseed water, leave it for 10 minutes, then wash it with clean water. 1. Pay attention to eating habits. The nutrients of the food also enhance the flexibility and density of the hair. Eat foods rich in protein, vitamins B, C, D and E, and zinc. In short, you need to eat more fresh fruits, vegetables, nuts, whole grains to promote hair growth. The food for hair care is: walnuts, spinach, flaxseed, lentils and blueberries. 2. Reduce psychological stress. A heavy psychological burden, high mental stress can also cause hair loss. Take steps to reduce stress and maintain a peace of mind. 3. More sports. More exercise can release stress. Exercise 30 minutes a day to help your body’s overall health, including hair. 4. Take hair care supplements. Sometimes it is impossible to get all the nutrients needed for hair through your daily diet. So we have to resort to supplements. Some supplements can speed up hair growth and increase hair density. Try taking biotin (vitamin H), Viviscal, fish oil, etc. 5. Check the medication you are taking. Some drugs have no effect on the hair. But some drugs affect the balance of hormones, leading to hair loss. Drugs such as birth control pills that alter hormonal balance are likely to cause hair loss. Ask your doctor if you can change other medicines. 1. Bald treatment. If your hair loss is serious, you can go to the pharmacy to buy a cream for the treatment of hair loss. Applying daily can promote the growth of hair in the hair loss area. 2. Hair transplants. Hair loss can be considered if you have severe hair loss or baldness. The surgical technique for male baldness is to transfer hair from other parts of the body to the bald top. Consult a doctor to see if your condition is suitable for hair transplants. 3. Buy a laser comb. This comb, which sounds very high-end, is the latest technological innovation that promotes hair growth through lasers. Of course, the price is very high, you probably need to spend 3,600 yuan. If you are worried about sparse hair, then it is better to buy a laser comb for yourself. 4. Pick up the hair. To connect the hair, use a string or glue to temporarily stick the hair to the head. The hair that was successfully picked up is very natural, but the price is not cheap. And after the hair extension, you should change it every three months. 5. Keratin therapy. This service is generally available in high-end salons. Keratin therapy specifically increases hair growth rate and consistency and shine. You need to do it every few months, and it costs about $300 each time. Even if it does not increase the consistency of the hair, it will make the existing hair healthier and without damage. 1. Change the hairstyle, can’t change the gene, you can use the hallucination to make the hair look thicker. Let the hairdresser trim the hair that is the most fluffy and looks the most. Increase the level of hair to make your hair look fuller. Especially effective for straight hair. If you don’t mind, try bangs. The contrast between Liu Hai and the rest of the hair will produce a visual effect with a lot of hair. Repair the tail. The split ends will make the hair look unhealthy and thin. Frequent trimming of the hair ends can make the hair look healthier and more vibrant overall. Trim every 6 to 8 weeks. 2. Using color to create a hairy environment, highlighting the hair will give the hair a three-dimensional feel and make the hair look more. However, as mentioned above, excessive bleaching can damage the hair. So it’s best to get close to the color of your hair color. 3. Real hair clips. If you are not ready to complete the hair extension, you can try the real hair clip hair extension. This type of hair extension is cheaper and more natural. General barbershops offer this kind of wealth. It is best to choose a hair that is very close to your hair color. Put it on your hair every day to make your hair look thicker. Do not wear the same part every day or wear a hat every day, which is not good for your hair. Keep an eye on the side effects of over-the-counter therapy. If you have questions, you can consult a doctor. It is best to consult your doctor before taking medication or vitamin supplements. About the product❤Double Anion Spray, Double Care for Your Hair - Archiking ceramic hair straightening brush is equipped with double anion spray technology, which makes your hair appear smooth, sleek and shiny, and it also plays a vital role in reducing split ends and knotting. The iron straightener is designed to have silky-looking natural and healthy hair, rather than a flat burnt look.❤Easy to use & Saves Time - Plugin, heat up, brush and go, it’s easy and it cuts styling time in half. 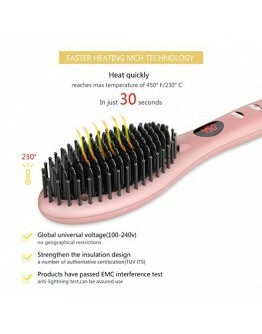 This hair straightener brush reduces the straightening time in half, and it results in silky and frizz-free hair instantly.❤30s Fast Heating Time & 4 Adjustable Temperature – the inclusion of MCH technology is responsible for improving the heating response time, which saves hair styling time and energy, it can reach the setting temperature just in the 30s. The straight hair brush is equipped with four temperature setting modes, which varies from 330˚F to 450˚F (170°C -230°C) and it is considered a suitable option for a variety of hair.❤Safer & Travel-Friendly - The electric hair brush is built with a 30 mins auto shutoff and a temperature lock feature, which ensures safety and energy saving purposes. Lightweight hair straightening brush makes no wrist ache, 110-240V dual voltage perfect for travel and vacation.❤Warranty – We present the device to you with 60 days money back or one-year quality warranty, if you have any issues with ARCHIKING ceramic straightening brush, please feel free to contact us and we will take an action within 24 hours.Product description❤ARCHIKING Hair Straightening Brush, brush your hair smoother and shinier, brush a new day!Why You Need ARCHIKING Hair Straightener Brush?❤Quick to use: If you're sick of spending ages doing your hair in the morning, get a ceramic straightening brush. They cut the time of styling your hair, which means you can get out of the door faster.❤Anti-frizz: If you struggle with frizzy hair, an ionic straightening brush can save it. It seals the hair cuticle reducing the frizzy look of your hair, and it also plays a vital role in increasing hair manageability. Give your hair a quick swipe with the brush before you leave the house, and it will stay sleek and shiny for an extended time period.❤Safer: The bristles on the straightening brush are designed seamlessly using AA-grade protection technology, which keeps you from touching the plates of your brush. Our straight hair brush is endowed with FCC ROHS certification, shell and comb teeth are high-temperature-resistant flame retardant materials, which makes it an excellent choice for you.❤Can be used every day: Using a traditional hair straightener can be detrimental to your hair, and our hair electric hair brush can be used on a regular basis, without causing any additional damage to your hair.❤Less heat damage: If you have damaged hair, you may think that you can't straighten your hair any more until you grow it out. In fact, you still can! This straightening brush has double anion spray which does much less damage to the hair.Tips for using brush straighteners:1. Only use it on dry hair.2. Brush your hair first to get out all the tangles and knots.3. Heat up to the right temperature (always start low and gradually get higher until you find the right setting).4. When the LCD shows "LOC", it means that the buttons are locked, you need to double-hit the power button to unlock.Product detailsProduct Dimensions: 11 x 2.1 x 1.6 inches..
About the productDouble Negative Ions: The GLAMFIELDS hair straightening brush seal the hair cuticles and lock in your hairs natural moisture, to eliminate frizz, split ends, knotting and adds shine, repairing the hair quality of harm, make a smooth, silky, natural lustrous look.Advanced MCH technology: Characterized by Heat Quickly, Save Energy, More Durable, Lasts Longer,it heats up within 30 seconds after boot, wider and denser comb tooth also decrease the time of straightening.4 Heating Setting: There be four different temperature levels from 330˚F to 450˚F (170°C -230°C), to provide you with total control for all your hair condition and hair styling needs.Easy To Use & Travel-Friendly: Small Size with 360 rotating handle, which is easy to operate with one hand to reduce the pressure of the wrist, the international dual voltage 110-240V with extra compatible adapter perfect for travel and vacation.Safety Controls: Made of High-quality flame-retardant plastic, the automatic shut-off after 30mins no action for security, temperature lock function can avoid accidentally changing the temperature. [Warranty] GLAMFIELDS provide 1 Year Guarantee and 3 Months Free Replacement or Refund.Today hair straightening brushes are the latest fad among girls with all hair types. Gone are the days of flat ironing your hair with all that excruciating pain! If you want to try something new and versatile, Glam field’s hair straightening brush is just the right thing for you. The Glam field’s hair straightening iron brush is ideal for people who prefer a natural healthy look for their hair over the poker straight look. This hair straightener brush is truly the smartest hair styling solution ever.Ceramic comb teeth can heat up fast without wasting time waiting, the straight hair effect can be kept for a few days before shampooing. Double Anion repair rough, bifurcated and damaged hair, make hair a natural, healthy and sleek look. Adjustable 4 Heat Setting is suitable for all kinds of hair condition and hairstyle. International voltage, 360 rotating handles, 30 minutes auto off, temperature lock, Small details show the user-friendly design. Mini rose gold body with black combs and high-end gift wrap, the best choice for a gift.2018 GLAMFIELDS Newest Version Hair Straightener Brush: 30s Heats Quickly; Advanced MCH Technology; Double Ionic for Healthy Silky Hair; Update Nylon nano Comb brush, High Temperature Resistant and Increase density fit for all kinds of hair types. Fashionable Design!HAIR STRAIGHTENING BRUSH & FLAT IRONYou might be having second thoughts about trying out a straightening brush if you have been using flat irons for the longest time. So let’s get down to the points that will give you a better understanding of how a hair straightening brush works better than a flat iron.QUICK RESULTS – Getting your hair straightened through a flat iron means spending hours in front of the mirror till you get it finally done! While a ceramic straightening brush requires you to do is to run through the hair a few times and get a section done!PRESERVES NATURAL MOISTURE – One of the most significant features that give a straight hair brush an edge over flat ironing is its ability to preserve the natural moisture of your hair. When you use a flat iron to straighten your hair, it is very likely to steal away the moisture from your hair.SAFE TO USE – A straightener brush is much safer to use in comparison to flat irons. A flat iron has hot plates that are quite easy to come in contact to anyone while using them. These bare hot plates can cause burns if touched accidentally. But a straightening brush saves you from any such possibilities, through their protecting bristles.KEEPS THE VOLUME OF THE HAIR INTACT – If you are someone who likes to style your hair keeping its natural volume intact, you must go for a straightening brush instead of a flat iron. Ironing will give your hair a flattened look, taking away its naturally rich volume and shine. A straightening brush will straighten your hair without transforming its natural shape and add more individuality to your personality over a flattened look that appears all the most same on everyone.BETTER HEAT PROTECTION – Heat protection is one of the most crucial factors that make a straightening brush a much better option over a flat iron. Extreme exposure to heat can damage your hair to a great extent. It can lead to weakened hair, split ends, and hair fall. Even a one-time use of flat ironing can cause severe damage to your hair. A straightening brush on the other hand will not cause such extreme levels of damage to your hair. .NO PAINS – Using a flat iron to straighten your hair can be quite a painful experience with all the clamping and dragging involved in the whole process. But when you are using a hair straightener brush you can save yourself from all the painful tugging as the brush tends to run through your hair from the root in a more smooth way.Double AnionThe double negative ion feature of this hair brush iron straightening helps you get rid of extra frizz from your hair and fix damage, making it ideal to use on frizzy hair.4 Temperature ControlThe Glam field’s electric hair brush offers four different temperature levels for you to choose from. You can set the temperature levels on the brush from 170 degree Celsius to 230 degree Celsius to meet your styling needs.Heat Up 30s & Anti-ScaldSave precious time with our extra speedy heat up MCH technology that allows you to start straightening your hair within 30 seconds. Our well-loved brush comes with an automatic shut off and temperature lock safety feature. Universal voltage for worldwide usage. 360 Swivel Power CordThis compact simply straight brush comes with a 360 rotating handle that helps you operate with one hand with utmost convenience.Fashionable and Efficiency DesignSmall size for ultimate convenience while styling Next generation 360° anti-scald bristles 59 bristles allow 7 times more contact than a flat iron in every stroke.Please Note:If you leave the buttons still (unpressed) for 5 seconds, all buttons of the device automatically locked; press the power button twice constantly to unlock.The Best Tips for Straighten Your Hair (IMPORTANT):❤ Use only on dry brushed; ❤ Cover less hair in one stroke once for thick and curly hair;❤ Brush Slowly in a pulling motion; ❤ Make Sure your hair gets deep into the inner area of the brush.Specifications: Heater: Metal Ceramic Heater (MCH)Temperature range: 330°F to 450°FWarm-Up Time: 30 secondsAutomatic Shutoff: 30 Minutes360°Rotate Swivel Power Cord: YesVoltage: 120–240V ACFrequency: 50 -60 HZPower: 45W Package Including:1 x Hair Straightening Brush1 x Heat Resistant Glove1 x Cleaning brush1 x Cloth Bag2 x Plastic Hair Clips1 x User Manual.. Personal care and health have been raised up to daily life course in my course, I am a high school b.. Periodically trimming hair really make it grow faster? Regular hair cutting does not grow faster. Although it is widely believed that regular hair cutting ..
Why does your hair keep falling? Why your Hair Falling? You confused, worried, upset, even can not fall into sleep at night. Go to th..
Can Glamfields Hair straighter be used on African-American hair? Many people go through Glamfields, and they often ask a common question"Does this hair straightening..